Save $1,000 per couple off this sailing when you book and pay in full. Click here for eligible departures. Enjoy your included, one-night stay at the historic Peabody Hotel in downtown Memphis. The evening is yours to get self-acquainted with this city's famed eateries, unique shops and lively entertainment. Our Hospitality Desk will be located in the hotel for your convenience between 3:00 PM and 7:00 PM. It is here that our friendly staff can assist with everything from general questions about your upcoming voyage to reserving Premium Shore Excursions. An American Queen Steamboat Company representative, as well as a local representative, will be readily available to provide you with dining, entertainment, and sight-seeing suggestions so that you may maximize your time in Memphis. At the northern reaches of the Mississippi, Tunica is one of South's leading entertainment destinations. It is home to nine casino resorts and three championship-level golf courses. 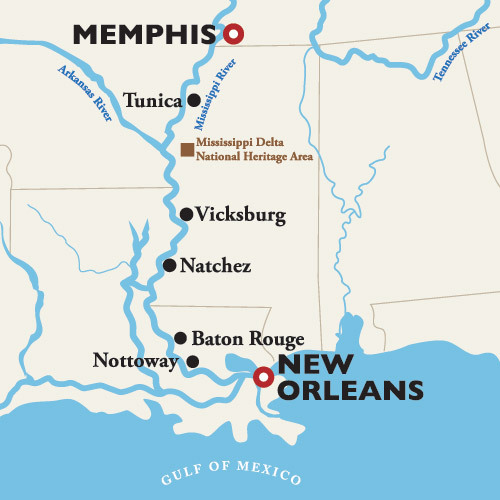 Tunica boasts more than just entertainment though, as it is a popular starting point for the Mississippi Blues Trail, a scenic highway that winds through Mississippi and takes yoiu to historic blues markers and landmarks. AN AMERICAN CHRISTMAS - Make our home your home for the holiday and fall upon the timeless traditions of the Cajun and Creole cultures as you journey amidst a glittering wonderland of holiday décor both onboard and ashore. From Memphis to New Orleans, the river rolls smoothly and expansively carrying you to gracious towns brimming with Christmas cheer and palatial mansions draped in holiday finery. During the holiday season, you will discover that we offer an abundance of enriching onboard activities to truly make you feel at home. Gather with family and newfound friends to design your own unique ornament, decorate freshly baked cookies together and simply enjoy the slow pace of life on the river.